Being a cycle-friendly city means more than just providing some nice cycleways; all activities need to think about how they can support cycling in what they do. 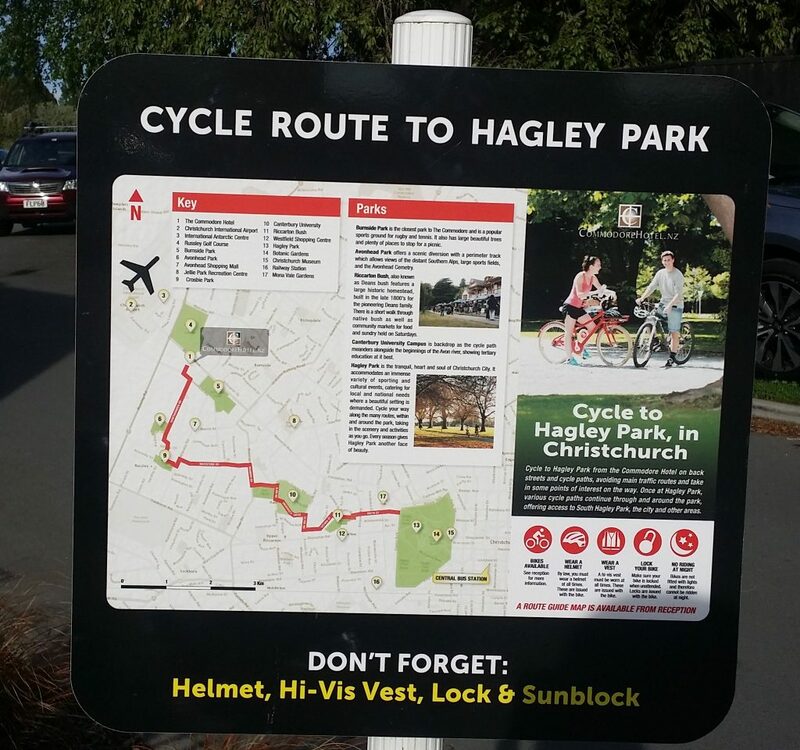 So it’s nice to see examples of businesses around Christchurch that have made the effort to incorporate biking. A few weeks ago, I had to travel across town to a workshop being held at the Commodore Hotel in Burnside. I combined biking and busing to ease the riding distance, although the last bit biking along Memorial Ave is not much fun. However, I was pleasantly surprised when I got there to see some visitor parking right outside the meeting rooms (and well used too it seemed). Some parking hoops instead of the classic “wheel-bender” racks would make life easier for securing and stabilising your bike, but what’s there is a pretty good gesture. Even better was the fact that a fleet of guest bikes was also situated alongside here, in a variety of styles. Any staying guest could go to reception to make free use of one of the bikes for exploring the city. Welcome guests, why not try a bike? But where to ride to (especially given the not-pleasant experience of Memorial Ave)? Fortunately, the thoughtful people at the Commodore had also thought of this and provided a handy map showing a route right into town. Now I’m not sure that I’d have people riding down Maidstone and Waimairi when they could be using the quieter Dovedale Ave crossing point, but otherwise the map provides a nice route,, largely replicating the coming Uni-Cycle cycleway route. So, well done Commodore Hotel! 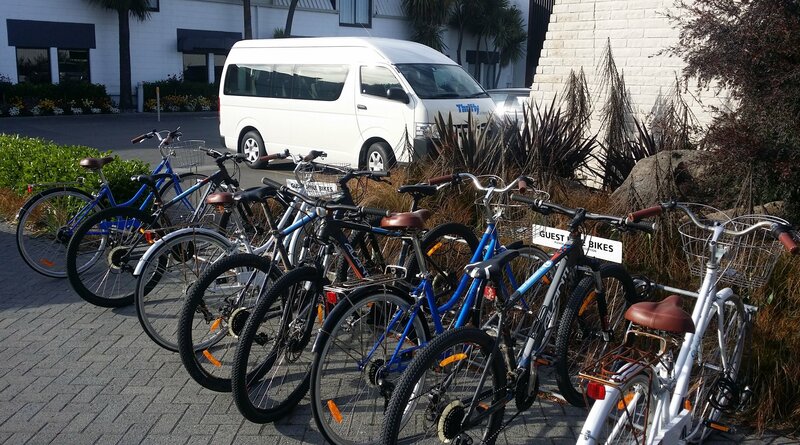 There are other cycle-friendly accommodation establishments in Christchurch that offer either complimentary or for-hire bikes; you can find a list of the ones we know of on our bike rentals page (let us know if we need to update this list). 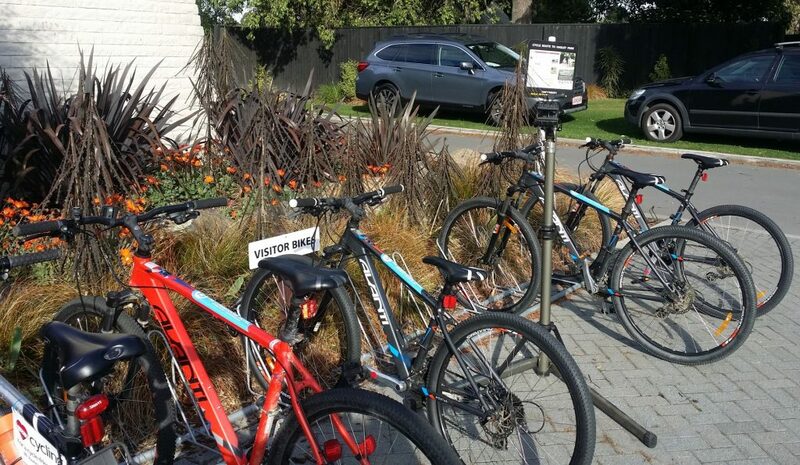 Have you encountered good examples of bike-friendly businesses around Christchurch? Thumbs up Commodore Hotel ! We need to support places that support us. How many service stations have bike stands/racks ? I can only think of one in all of Christchurch, and that’s the Mobil at the roundabout between Centaurus Road and Wilsons Road. Mad Props to them for being Cycle Friendly. 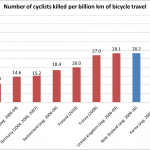 What other businesses support cycling, when its not their core business ?